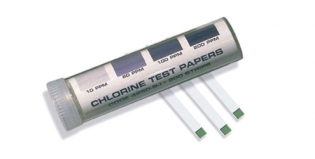 Compact Dry EC is a ready-to-use test method recommended for the quantitation of Coliform bacteria and E.coli in raw materials, finished products, water and evironmental surfaces. Enumeration of Coliforms & E.coli provides an overview of the hygenic status of raw materials and production. 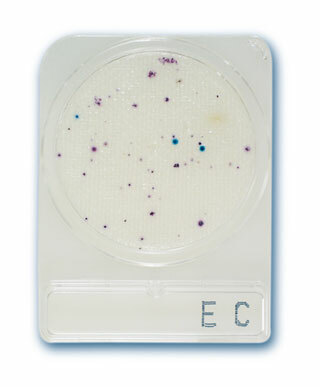 Compact Dry EC is a 50mm diameter plate which contains dehydrated culture media and a cold water-soluble gelling agent in a non-woven cloth matrix. The medium is instantly hydrated when inoculated with a sample, and capillary action diffuses the sample evenly over the matrix to form a gel within a second. 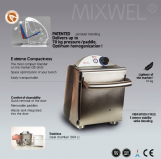 Compact Dry EC contains two chromogenic substrates, Magenta-Gal and X-Gluc, that yield a coloured reaction when utilised & permit the differentials of E.coli from other members of the coliform group. Purple coloured colonies indicate coliforms (galactosidase) while blue colonies indcates E.coli (glucuronidase).